Ukraine’s drive to become a European country is forcing Russians to recognize that their country isn’t one, a reflection that helps to explain why many Russians are so angry at Ukraine and so willing to accept the Kremlin’s version of events there, according to Artemy Troitsky. In a commentary in “Novaya gazeta” yesterday, the Russian journalist says that in his view, “one can consider a European a country which sincerely wants to be European, even if not everything in it yet corresponds to that status. In this case, Ukraine is undoubtedly one,” but Russia is not. “Yes, [Russia has] autocracy instead of democracy, problems with human rights… but on the level of culture, mentality, and general civilization,” Troitsky says, “of course, we Russians are ‘white people’!” And Russia’s failings like corruption are to be found “not just in Nigeria” but in European countries like Greece and Italy. But the reactions of Russians to Ukraine’s announced goal of joining Europe changed that, he continues. At the very least, that effort by a neighboring country “cast doubt” on Russia’s relationship to Europe and suggested to many that the whole notion that Russia is part of Europe was problematic if not wrong. Over the past year, he points out, “the words ‘Europe’ and ‘European’ have become with [Russians] terms of abuse,” a sharp change from the recent past when the term “’European’” was considered a compliment. Now it is a synonym for perverts, weaklings, and degenerates or even worse. Among Russians, Troitsky says, this “active anti-Europeanism was not so much declared ‘from above’ (there they still prefer more diplomatic expressions) than arose from below,” but the extent to which it has spread is reflected not just in Russian attitudes toward Ukraine but in Russian reactions to the recent terrorist attacks in Paris. Widespread Russian anger at Ukrainians over the last year “shocked but can easily be explained by the total television propaganda” to which Russians were subject. But “in the drama of Charlie Hebdo, no Russian national, political, historical or geographic interests were involved.” Moreover, many Russians have little sympathy for Islam more generally. However, the frequently expressed view among Russians that the French themselves were to blame for what happened because of their excessive tolerance “in a distilled form” highlighted just how far from Europe many Russians are. “’Freedom? What freedom?” was the Russian question. To put things even more bluntly and clearly, he continues, it is possible to say that “the aversion of the majority of Russians to so-called European values is stronger than dislike to Islamists and hatred for terrorists,” even though Russians have suffered from the latter to a significant degree. 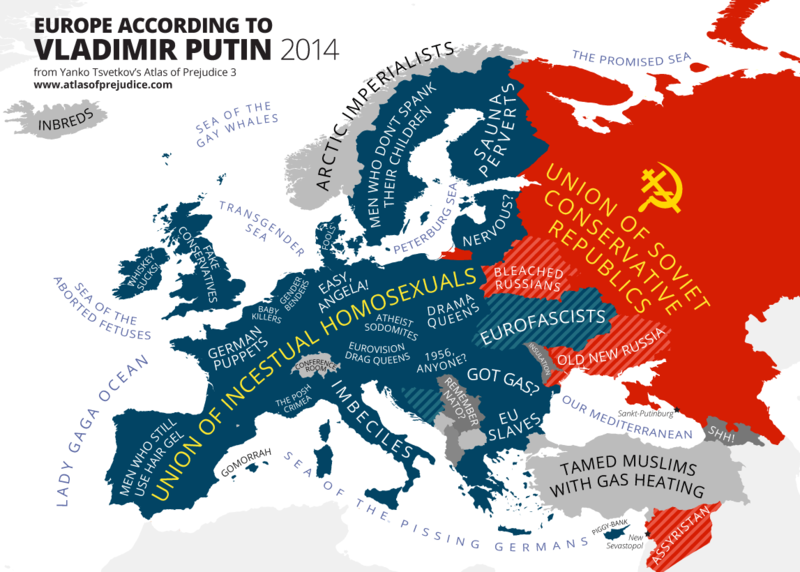 This is logical but only in terms of the logic of what he calls “the paradigm of 2014/2015.” Russia’s positioning of itself relative to Europe, Troitsky argues, is “not identical but similar” to the one between the Middle East and North Africa, on the one hand, and Europe, on the other. In both cases, Europe is geographically close up, economic ties are close, and there is a diaspora from them in Europe. But at the same time, there is “a complete alienation in terms of value orientations, moral priorities, and other firm issues of a humanitarian nature” which Europe embodies. There is “nothing new in this situation,” the journalist says. “We are simply returning to pre-Petrine times when the relations of Russia with Europe were sometimes full of conflicts, sometimes pragmatic, but never close.” The opening of the “window on Europe” made Russia a European power, but it did not make more than a tiny fraction of the population Europeans. The collapse of the USSR and communism led Russians to accept many of the aspects of capitalism, but beneath the “glamor” of wealth for some, there also reemerged something “enormous and dark” which has now assumed the dominant position – an antagonism to Europe and all things European. One might call this “the triumph of ‘nationality’” in the Uvarov sense with its “ideology of ‘a new medievalism,’” something that might have been appropriate in the 14th century but looks like “a caricature” in the 21st. “Present-day Russia does not have any allies unlike Europe or strength like China or an iron religion like the Arabs,” and thus it is increasingly defining itself not in terms of what it is but of what it is not – and it is not European, the Russian journalist suggests, however much some would like it to be otherwise.